If you make the recipe exactly as is, you’ll end up with a fairly brothy soup. To me, it was perfect! However, if you prefer your soup to be a little thicker simply modify some measurements – little less broth, little more cheese. Keep the cream the same! The hot sauce, yep I said hot sauce, does not take much! Be conservative with the ‘few drops’ the recipe calls for especially if you’re sensitive to spice! Sharp Cheddar cheese is specifically selected for this soup so I wouldn’t recommend switching and using a different type! Leftovers taste even better the next day and the day after that too! Have I mentioned how easy it is to make? Step One: Chop your veggies! Start by chopping the onion, broccoli and carrots. I always recommend fresh veggies for soup over frozen and the cooking times below are based on fresh veggies! I peeled and chopped whole carrots, but baby carrots can be sliced up and used as well. Melt butter in a large stockpot and cook the onions until soft. Then add the broccoli and carrots, stir all the veggies together and season with salt, pepper, paprika and just a couple drops of hot sauce. Stir well after adding the seasoning too so nothing burns! Cook until the veggies are nice and tender! In addition to the seasoning, add a couple drops of hot sauce! If you’re very sensitive to spice, I really think you could omit this ingredient and still have delicious soup! I only added a conservative two drops and it was plenty for us! Well, for me….Hailey and Allen love spicy and can definitely handle more than me! Step Three: Add Chicken Broth, Heavy Cream and Mustard! Add all three of these and stir to mix well and then simmer over medium to low heat for around ten minutes. I think mustard is another unsuspecting ingredient in this recipe and the one I forgot to mention in my Instagram Stories! What can ya do! For the cream, you could do any variation of whole milk, heavy cream, half and half or a combination depending on your preference. I always use heavy cream in soups like this and feel like it works best! In a small bowl, you’ll whisk together half of a cup cold broth (I measure this out at the beginning and put it in the fridge to cool) and a fourth of a cup cornstarch. Then, pour that into the stockpot of soup and whisk until smooth. What’s great about cornstarch is it keeps the soup gluten free and it’s a more powerful thickener than flour so you don’t have to use as much in your recipes! Step Five: Season to taste and add that cheese! Do a quick taste test and add a pinch of salt and pepper if you’d like. Then add sharp cheddar cheese and stir and mix until it’s just melted. At this point, you can reduce the heat to just keep the soup warm until it’s ready to be served! Highly recommend serving bread, rolls or the like alongside this dish, because broccoli cheddar is such a good dipping soup! If you’re serving a crowd, be sure to double this recipe; it will go quick! Also, not directly related to food but kind of related because it’s about taking photos of food…I decided to use my phone to take all of the step by step photos this time, because it’s so quick and easy that way and Oh my gosh! I recently got the Pixel 3 Google phone specifically for the camera and hi…exhibit A! I’m really impressed with its ability! It’s not a replacement to my beloved Canon by any means, but in times when it makes life easier and produces good quality photos I’m on board! So if you’re looking for a camera that also calls and texts people, definitely add the Pixel 3 to your comparison list! 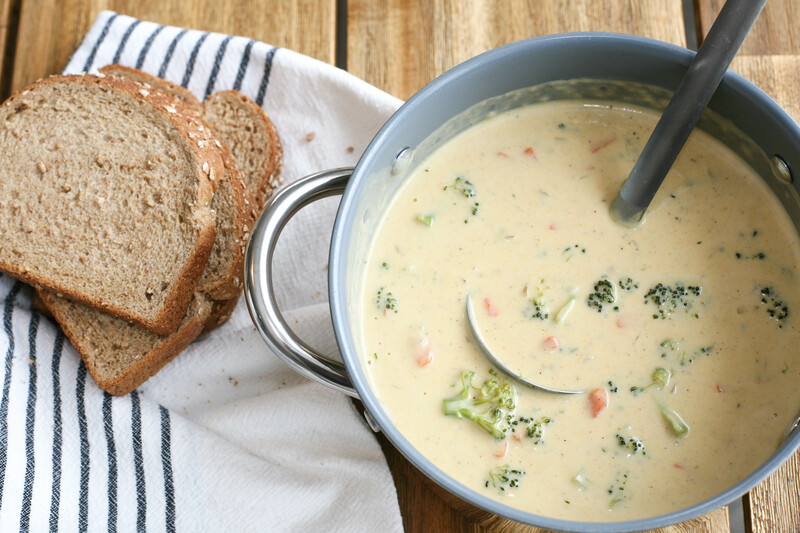 If you like the broccoli cheddar soup at Panera Bread, you're going to love this recipe! Melt butter in a large stockpot. Add onions and cook for about 5 minutes, until soft. Add the carrots and broccoli, stir with the onions and cook for another 3-4 minutes. Season with salt, pepper, paprika and a couple drops of hot sauce, if using. Pour broth and heavy cream into the stockpot along with the mustard. Whisk until smooth and let simmer over medium to low heat for around 10 minutes. In a small bowl, whisk together the cold broth and cornstarch until smooth. Pour into the stockpot and whisk again until smooth. Simmer for another 5 minutes. Taste and season with additional salt and pepper if desired. Add cheese, stir to mix well and cook just until the cheese is melted. Reduce heat to keep soup warm until you're ready to serve. Pair with bread for dipping and a sandwich or salad on the side! Sharp cheddar cheese will work best; you may also use extra sharp! This entry was posted in Dinner, Lunch, Recipe Book and tagged broccoli, broccoli cheddar, broccoli cheddar soup, carrots, cheese soups, comfort food, creamy soup recipes, dinner recipes, easy soup recipes, hot sauce, lunch ideas, panera bread, panera bread broccoli cheddar soup, panera bread copycat recipes, panera copycat broccoli cheddar, soup. Bookmark the permalink. Such a comforting meal – my girls really love this soup in their lunch thermoses for school! Yum, this looks incredible! I love the tabasco and all that cheddar! Plus the texture makes it such comfort food! This sounds delicious! Broccoli soup is a favorite around here, and all that cheddar sounds like a win! Adding tobasco to cut through all the cheese is such a great idea. Pure comfort food! I know a couple people in my family would absolutely love this dish. They thank you in advance! Ahhh it’s my order, too. And I’m glad I can make this at home. Comfort food in a bowl.